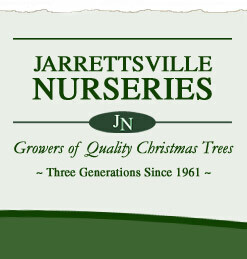 As one of the largest Christmas tree plantations in the state of Maryland, we offer 1,000's of trees with prices starting at $55. We offer a wide range of tree types ranging from 5 feet to 10 feet tall. You can select your own Christmas tree from our fields, or for your convenience we have beautiful already-cut, fresh trees available for purchase. Use our "Christmas Tree Guide" below to find the type of tree that might be just right for you! With so many trees to choose from, whether you continue a family tradition or start your own, remember, you can start your tradition with a real Christmas tree! * Prices listed above include sales tax. Measure the ceiling height in the room where the tree will be displayed. The trees in the field look small when the sky is the ceiling. Don't overbuy. Measure the width of the area of the room where the tree will be displayed. Most trees on tree farms are trimmed to an 80% taper. So a tree that's 10' tall will be 8' wide at the bottom. A tree that will fit in the room vertically may be entirely too big horizontally. What decorating theme will be used? Some species have more open foliage, stiffer branches or longer needles. Research the characteristics of the different species before you shop!